A man in the old East Germany went to the showroom to buy a Trabant. “Come back in thirteen years,” the salesman said, “it’ll be ready for you then”. The VEB Sachsenring Trabant was a gift for anti-communist propaganda. It looked like something from a 1950’s cartoon and had an engine better suited to a lawnmower: 600cc, 26 brake horse, 0-60 on seven day’s notice. It was not really made of cardboard, as rumoured in the West, but some panels were made of a plastic reinforced with old wool and other sweepings-up. It appears in most lists of the worst cars ever built. I had always wanted to drive one. I was in Berlin and poking about near Checkpoint Charlie when I happened on an outfit which ran self-drive Trabant tours. Mine had been pimped up with a soft top conversation, electric windows and a metallic pink paintjob. But it still had the skinny original wheels, and the little engine was standard. It was as Spartan inside as a race car. The speedo went up to 140kph, which was as ambitious as any of the DDR’s production targets. Next to it was what might have been a rev counter, but did not seem to do very much. There was a hefty rocker switch for the lights and a few knobs which I think were just there to fill space. 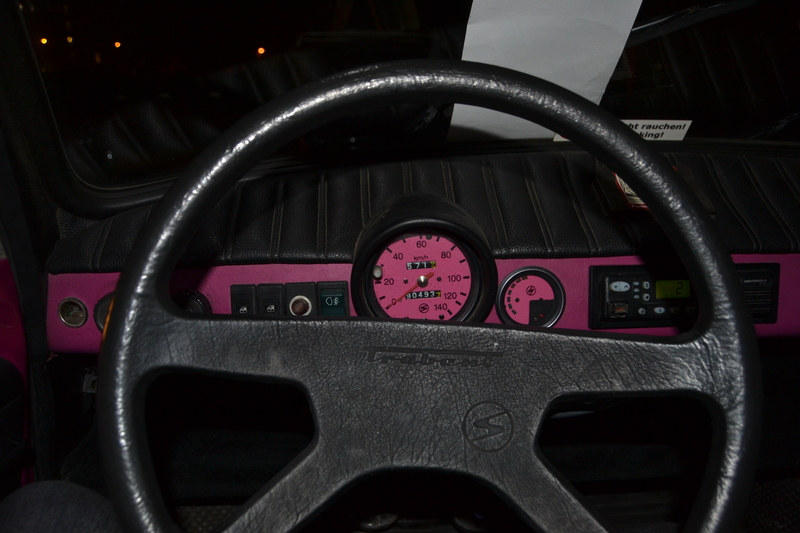 A flimsy stalk protruded from the steering column: up and down to indicate and forward for the horn, which worked one time in four. There was a sturdier lever on the other side for the gear change: forward and down for first, then up for second, back and down for third and up for fourth. I knew that the engine was two-stroke, but I still laughed when I started it up and it ring-ting-tinged like a moped. Then a cloud of blue smoke engulfed me. The gearbox growled and struggled against me as I tried to wrestle it into first, but I overcame it with the sort of brute force the Stasi might have used on a prisoner. There were six of us in convoy, following a guide who called out instructions on a one-way radio as we made for Potsdamer Platz. It was the Piccadilly Circus, the Times Square of the Weimar Republic, but was all but levelled in World War II, then bisected by the Wall and left as a vacant plot. Now it is ringed by skyscrapers designed by an aristocracy of architects. It was busy with commuters on their way home when we ring-ting-tinged past; and in my pink Trabant with the roof down and my arm draped over the door, I hammed the self-satisfied look of the bankers you see snarling round in Ferraris. They looked at me as if I was being serious. We drove on towards the Brandenburg gate, a symbol of partition, then of reunification, now gorgeously lit with video projections for the Festival of Lights. As we headed towards and over the river, some of the Trabants got stuck at the traffic lights and Audis and Volkswagens slipped in between them, incongruous as bungling spies. “We have some capitalist cars in our convoy,” the guide warned over the radio. He set off from the lights and turned left across traffic, and I slammed it into first, then second and scuttled across after him and forced a corpulent Mercedes to stop. PARRRRP! went his big bourgeois horn. Neep-neep went mine in response. We stopped and got out on Unter den Linden to look at the light shows on the cathedral, university and opera; then set off again, heading deep into the old East Berlin. We screamed through Alexanderplatz, past the TV tower, and on past the East Side Gallery, through Friedrichshain with its legendary nightlife. I had fought my way up to fourth gear by then, and with my foot flat down and the engine howling, I must have been doing at least 30. Yet I was having more fun than I have had in much faster, pricier cars. We met another Trabant tour going the other way and everyone waved and cheered and neep-neeped at once. It might have been a scene from a propaganda film in the days of the DDR.